Agricultural Society, with the main aim of improving the quality of cider. By the mid 1920s, much work had been done and much knowledge of good cider-making gained. Cider had become a purer more refined drink and had achieved the status of a wholesome national product and a prosperous home industry. Pickford’s survey at the time revealed that the custom of ‘cider as wages’ was dying out and the surplus farmhouse cider, usually a dry, often sharp beverage was only popular with the older members of the farming community. The pressure to produce a more marketable product led Pickford to initiate a series of extremely popular and successful cider-making training courses in regional locations. His notes give us a clear picture of the extent of Dorset cider orchards in 1938, and also provide us with vital clues towards rediscovering those that survive to this day. Although the acreage of Dorset’s orcharding is small compared with that of the other counties, it must be remembered that apart from the comparative size of Dorset, the soil in a big proportion of the county is of the type totally unsuitable for fruit culture. In those areas where the soil is suitable however the orchards thrive and are numerously planted and here the production of cider fruit is as much a business as it is in Somerset and Devon. The largest cider orchard area lies in West Dorset towards the Devon border including and around the neighbourhood of Loders, Powerstock, Netherbury, Beaminster, Broadwindsor and Stoke Abbott. There are smaller areas around Thorncombe, Whitchurch, Wootton Fitzpaine, Chideock and Symondsbury. Most of these orchards are planted in medium loams derived from the middle lias, but there are also quite a number planted in the very light soil of the Bridport sands, in particular around Melplash. In other parts of Dorset the orchard areas are smaller and widely scattered throughout the county. There is a considerable acreage around Leigh and Chetnole where a good proportion are planted in heavy loams from the Oxford clay. Scattered orchards are found around both Gillingham and Shaftesbury and again around Sturminster Newton, but cider orchards are more numerous in the neighbourhood of Child Okeford, Shillingstone and Hammoor where a good deal of cider is produced. Yet another area worthy of mention is that around Piddlehinton and Piddletrenthide where numerous orchards are found growing in the alluvium of the narrow valleys. Unlike the other cider counties, Dorset has never had any major cider producing factories such as Whiteways or Showerings. Sadly, because of this and in spite of Pickford’s professional instruction, cider-making never re-gained a secure status in Dorset, but remained an extremely local pursuit. Orchards that once supplied the liquid requirements of many staff and farm workers have now declined to a skeletal echo of their pre-War status. Our visits so far in 2004 have shown us a little of their former strength. The remnants of some of the old orchards contain grand old trees clearly dating back to more prosperous times. 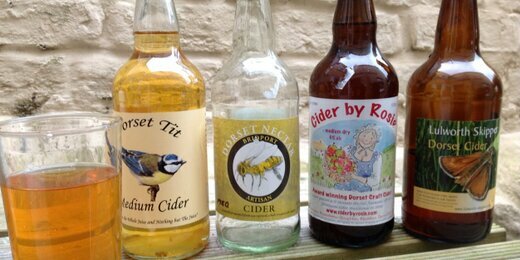 Typical West Country varieties appear; Crimson King, Woodbine and various dual purpose cider/kitchen apples. Interestingly, and perhaps because of Dorset’s rather inaccessible terrain, many of the cider apple varieties grown are peculiar to the county and are seldom seen across the borders into Somerset and Devon. Traditionally Dorset cider is soft, sweet and mild in astringency. This regional distinctiveness comes from Dorset’s own varieties, some of which we have already re-discovered such as Buttery Door, Golden Ball, Slack-ma-Girdle, Syme’s Seedling and Golden Bittersweet. Some will be the last remaining trees of these distinctive regional varieties and they deserve to be looked after and re-propagated before they disappear. The Long Ashton records reveal many other Dorset cider apples that could still be found. Although by far the majority of Dorset’s orchards were primarily cider orchards, some such as Stubbs Orchard, were clearly planted [before 1890] to supply large quantities of ‘commercial’ fruit, eaters and cookers. Here we discovered growing together with the cider apple trees, a selection of excellent and popular Victorian varieties including Harvey, Ribston Pippin, Royal Jubilee, Blenheim and Lord Derby, all of which are still happily being used by the present owners to create an excellent home cider.